Gambling can quickly transform from an enjoyable pastime into a dangerous obsession. Whether a person spends time in casinos or gambles online from his computer, he may be at risk for becoming a compulsive gambler. A gambling addiction is an impulse-control disorder, and it can occur even when a person does not gamble on a daily basis. Here are some signs that may help you determine if your loved one has a gambling addiction. A compulsive gambler may not gamble every single day, but he will spend a great deal of time at the casino or on gambling sites. He may stop participating in other activities that he previously enjoyed, and his time devoted to gambling may prevent him from focusing on work or taking care of his family. He may say that he will only play a game for a few minutes, but then he has trouble stepping away. A person who is addicted to gambling may even spend his free time obsessing about the next time he will get to play. If your loved one starts frequently changing the terms of his wagers in order to recoup losses, he may be addicted to gambling. This is one of the indicators that many online casinos use in order to identify a compulsive gambler. While most gamblers will occasionally use a “double or quit” strategy to make up for a loss, compulsive gamblers will repeatedly place bets that are designed to help them win back what they lost in a previous round. People who are addicted to gambling will often gamble away all of their income, but they still feel the urge to play even when they don’t have money to wager. They often turn to friends and family members for more money, and they may even steal in order to satisfy their need to gamble. Compulsive gamblers may turn to gambling when they have had a bad day or are feeling anxious. 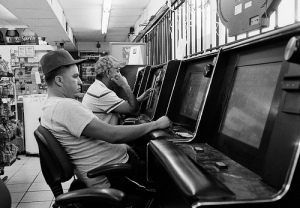 The act of gambling may help them temporarily forget about their struggles at work or at home, and they begin to rely on it more often to avoid their problems. This may even place a strain on their personal relationships because their sense of peace and fulfillment comes from gambling instead of their bonds with other people. Not everyone who gambles is addicted to it. If your loved one occasionally exhibits one of these behaviors, then he may not have a problem. However, if he exhibits more than one of these behaviors on a regular basis, you may want to discuss his gambling and encourage him to seek professional help. This entry was posted on Thursday, October 9th, 2014 at 5:25 pm	and is filed under Addiction. You can follow any responses to this entry through the RSS 2.0 feed. You can leave a response, or trackback from your own site.